By	Chris Celnar. Last edited by Marios Alexandrou on January 19, 2019. Chinchillas need to constantly chew on things to keep their teeth healthy. Might as well have fun doing it, wouldn't you say? Here are some of the chew toys we've tried over the years. Lava Bites are little triangular stones made out of mineral lava. Each triangle is made with a small hole in the middle so that you can hang or place the triangle on a narrow rod for the chinchillas to chew. In our case, we just placed a triangle in their cage and within 3 days it was completely gone. Our chinchillas just loved it and left nothing but dust as evidence. Chinchillas need to have ready access to items they can chew on to keep their teeth from growing too long. Various types of wood such as apple are safe for this purpose. If you don't have access to the right kinds of wood, consider buying wood chews from a reputable pet supplier. Our chinchillas seem to enjoy the Build-n-Bites product although we also provide various other types of wood for them to chew on. I have bought wooden blocks that have a hanger which I take off and put them on. They are miniature blocks like the ones you buy for children. 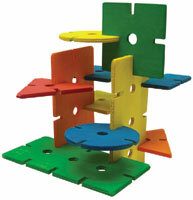 I was wondering if I can buy a set off wooden children blocks in place of the ones I'm using. There may be something wrong with your chinchilla, or perhaps that certain lava rock. My chinchilla has them and he loves to chew them, he doesn't weeze. Perhaps it is that call they give sometimes, the one that is a mix of a cry, scream, cough, and choke. It scares me so bad, I turn around and start talking to him, asking him why he did that. He just stares blankly at me. to amanda: plum and cherry is not really good for chinchillas so i would watch the amount u give to urs and monitor its health. All of the wood treats are really expensive and you have no idea what chemicals are used to make them those crazy unnatural colors. I use apple and pecan branches for my chinchillas and save tons of money by picking and drying my own from the backyard. Many local apple/pecan orchards will also let you pick branches ( make sure they don't use pesticides on the trees and apples). I usually dry the wood in the sun, but sometimes let them have small apple branches fresh with one or two leaves, buds and flowers on for something different. I also use the apples from the trees to slice and dry for treats that are better on tummies than raisins. If you don't have your own tree you can stop and pick apples in a local organic orchard and ask them if you can take ( or they can cut for you) some branches for treats when you are buying a bushel of apples; they have to trim the trees down like crazy in the fall anyway, so you could try going then and asking for small branches that are going to be mulched or burned anyway. You can cut big branches into chips and cut skinny twigs into small sticks that can be carried around easily. I don't care for those crazy colored things either! You just never know! I'm lucky! My grandpa has apple, plum and cherry trees! Gave Rin Chin Chin a stick and he went to town on it! I like to bake my branches, after being cut to size, in the oven at 450 degrees for 20 minutes before handing it to Chinny. cherry and plum trees are poisonous to chinchillas. apple however is fine. and they love it! just make sure the tree has NEVER been sprayed with pesticides. this will kill your chinchilla. and pesticides stay in the tree for years. I have been reading about giving my chinchilla a pumice stone(lava rocks) so I tried it. BEWARE: my chinchilla started weezing and it scared the crap out of me. She's okay now. The colored wood from housing made specifically for pets should be OK. The best is to check the packaging to make sure the housing was intended for an animal that chews. For example, I don't believe ferrets chew on wood so materials for ferrets are less likely to be chinchilla safe. My chinchilla has been eating the wood of his house, and I was wondering if the colored wood would hurt him. The paint seems to come off easily in water. P.S: It's the Superpet Tropical Hideout house. I am horribly allergic to hay which is a need to have thing for chinchillas, as my vet has told me. I need to find something to do what hay naturally dose, files teeth. There is only one problem my chinchilla has a very sensitive stomach and can not eat anything unnatural or sweetened and I think that colored wood would stain teeth (it stained my hamsterâ€™s teeth) Can you help? While Chinchillas need both hay and wood/lava to stay healthy, the primary role that hay plays in your Chin's diet isn't to file teeth. It provides them with a healthy dose of fiber, calcium, and other minerals, which keeps their sensitive digestive tracts healthy. Without hay, Chinchillas have an awfully hard time pooping, which can cause health problems quickly. I would recommend that you find a type of hay that is Chin-safe which you aren't allergic to. If you can't find one, maybe try buying those processed hay-cubes. I have heard that these reduce the number of airborne allergens that hay normally causes. We got ours from a Petco store. They have an online store too. 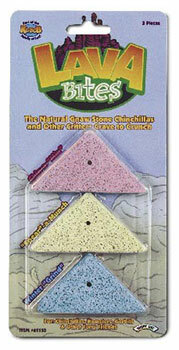 Those Build-n-Bites looks like tons of fun (for my chinchilla of course), but where can I get them? Is there a site I can purchase them from?